Welcome to a meandering cluster of words that, I hope, will appeal to bikers and and non-bikers alike. 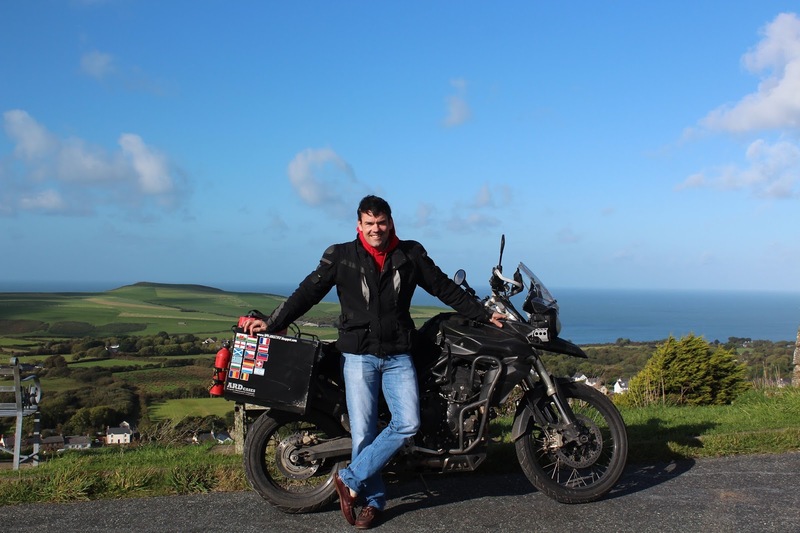 It aims not to tell a story but to provide an insight into why so many people choose to ride the world rather than walk or spend their travels in a metal box with the luxury it provides. This title is a song by Twisted Sister. What a ride, what an experience. I’ve learnt some useful lessons for any future trips and collected memories that’ll last a lifetime. The views, the riding and the different places made up the trip but the people were the glue that brought it all together. From the crazy ex-Spetsnaz guy in Israel to new friends in Germany, family in the UK and everyone in between. Of course none of this would have been possible without the unwavering support of my wife who single headedly managed our family in Jordan while I was having a jolly around Europe. Thank you darling. One of the things that struck me during the ride was the kindness of strangers. Before I left I read lots of opinions on the internet and heard plenty of horror stories about motorcycling through Europe. Most people seemed to be intent on scare mongering based on news headlines out of date hear-say. During this trip I never felt threatened and I didn’t witness anything that made me think that I was heading into trouble. Maybe that’s because most sources exaggerate for the extra drama, maybe it was because I employed a healthy level of common sense or maybe I was just lucky. I think it was down to the first two. The second of which included 3 very basic rules; don’t ride at night, take my time and avoid major cities. As a result, I was pleasantly surprised by nearly everyone I came across; offers of a bed for the night, a free drink (and often lunch) and a willingness of people to tell me about local sights, roads and eateries came thick and fast along with questions about the bike and the trip. 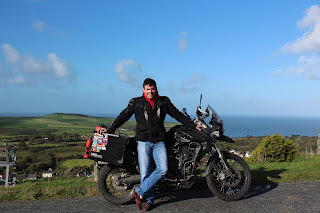 I think that, on the whole, people recognise that a motorcyclist has chosen a method of transport that makes them inherently vulnerable, it’s a method of transport that leaves you at the mercy of the people and environment you’re riding through. There are some people who would take advantage of this for their own benefit but most react with kindness. It was great to find my fear (mostly the fears of others really) completely unfounded. I ticked of 14 countries during the ride and one of the most common questions I’ve been asked is which one’s where the best? In third place is Greece. I really didn’t know what I would find in Greece but for some reason my expectations where set to “low”. It’s fair to say I was very wrong. Greece is fabulous, once you get into the sticks the roads are empty and zigzag over beautiful mountains, not the same as the big European passes, but fantastic in their own way. Just when you think you’ve seen all Greece has to offer it hits you with a new riding sensation, a vast plain, a sea view, off-road tracks that go on for so long that you think you’re never coming out. It’s simply great adventure riding. The cherry on the cake is the people who are lovely. Romania is in second place. I have to caveat that by saying that I don’t include the south of the country where the roads a bad and full of HGVs. However, from the start of the Transfagarasan northwards it is an amazing country, full of extremes. For example, the Transfagarasan its self is amazing, if you took the Isle of Man TT circuit, draped it over the hills of Glen Coe and asked an angry 2 year old to “draw” some extra road then took out the straight bits you would almost be there. It’s simply ridiculous, but oh so much fun. Once you’ve finished you can head off-road into some amazing countryside. The towns and villages are the same. One minute you’re in a modern western town then next you riding through a village where it’s clear that the horse and cart are the main form of transport. For its contrasting awesomeness it has to be in the short list. In first place: Bavaria. Extraordinary in its beauty, full of genuinely lovely people who share a great sense of humour and a passion for their small patch of Germany. This is made evident by how well kept everything is, from the flowering window boxes perched on most window sills to the healthy livestock in the perfect fields and stacked winter stocks of logs. If I had to leave the UK tomorrow you’d find me here. I can shake my hands like this and I shake my feet like that……. That could be on repeat for 10s of miles before I start talking, out loud, about the benefits of a flippy floppy hat in the burning hot sun of the desert. Do you still want to be a fly inside my lid? Didn’t think so. This trip was easy to organise and easy to do without breaking the bank. 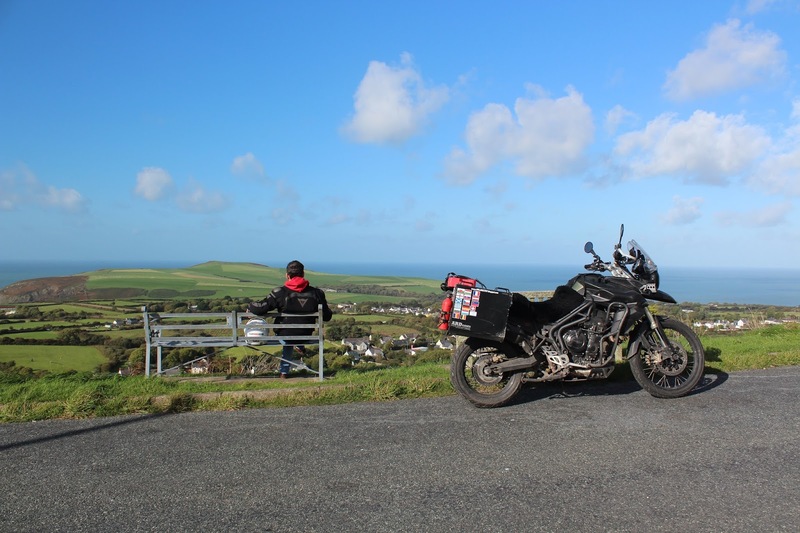 If you’re thinking “I would love to do something like that but….” Then pack your bike with whatever you want and ride to Dover £25 gets you into France, £10 gets you into a camp site and a fiver in Lidl buys you a days food. Can’t be assed to plan? Then don’t, just get on your bike and ride. I have some video, more photos and a conclusion to write. If you have enjoyed following this so far (even if it's just to correct my spelling, punctuation and grammar) then don't panic, I'll be back.... Soon. Mud, rain and that easy rider feeling. I was woken by the sound of a hard revving engine. Through bleary eyes I looked outside and saw my brother with a 1960 Triumph Herald. The bonnet was open and he was sitting on the wheel revving it via the throttle cable. I wrapped a towel around my waist and sneaked up behind him. As he turned I shouted: “I love the smell of petrol in the morning!” in my best impression of Lt Col Kilgore in “Apocalypse Now”. He wasn’t expecting to see me and it’s fair to say he was surprised. He is totally addicted to anything that runs on petrol and soon I was being shown around his latest acquisition. I broke off the tour in favour of a shower, breakfast and strong coffee. When I re-emerged he had gone out but was coming back soon. So I said goodbye to Tileri and went to get the bike and load her up. When I had finished Jezzer had returned and I said farewell before riding into town to get a present for mums birthday. With my town mission accomplished I headed west to see my other sister. She wasn’t in but would be back soon so I hung around and when she came home we had lunch together before she went back to work and I rode to Pembrokeshire. Because of lunch I had lost track of time and realised that I wouldn’t arrive in Pembrokeshire until about 7:30pm. Never mind, I’m taking the back roads so it was never going to be direct and I was never going to arrive early. As I rode across the B roads of Gloucestershire I hit a patch of deep mud on a corner and very nearly went down for the first time on the entire ride (discounting a little off-road drop in Romania and the fall on the ferry). It took a strong stamp from my right boot in order to keep the bike upright. Vowing to take it easy I carried on towards the Welsh border. I was aiming for the Heads of the Valleys Road and A40, it’s a route I have always know and one that evokes great memories from home, school and my early days in the Army. As I crossed the border into Wales I felt my heart lift slightly as it always does when I return to the Land of My Fathers. Once over the border it doesn’t take long before the road becomes great fun as it heads towards Brecon. However, true to form, it started raining just east of Brecon and it gradually got heavier the further west I went. If I go much further west I'll get wet feet. It’s typical that the only day of rain I have had during the entire course of the ride is on the last leg heading for my parents house. It didn’t lift and as I headed further from west it got gradually worse and, at its height, was joined by thick fog. I wasn’t going to let it force me into taking the quicker route and I continued to strike out over the hills. Maybe it was because of my refusal to take the easy option that I ended up somewhere I hadn’t been before. I wasn’t lost you understand just in the wrong place. A quick map check and I was back on track in no time and would soon smell the sea. As I came into the final few miles of the ride I had visions of an “Easy Rider” style ending so I rolled off the throttle and took it easy, “I’ve just got to bring it home, don’t mess it up now.” I kept telling myself. Finally, after the best part of 5,000 miles I rolled down the drive to the house, arriving just as it was getting dark and was able to enjoy the view over the Irish Sea in a moment of quite before putting the bike under cover and going in to see my parents. After being away for so long it was great to be back and in time for mums birthday tomorrow. We caught up over a drink and I went to be early looking forward to waking up in my childhood home. A heavy lift, some advisories and a bacon butty. When I got on-board last night I went to find somewhere to sit and write straight away, not because the ferry was full but because I didn’t want any of the drama to be diluted by a good night’s sleep. After finishing yesterday’s entry it was nearly 1am and I quickly discovered that I shouldn’t have worried about having a “good night’s sleep” lying on the deck was very uncomfortable and I hardly slept at all. At about 5:30am I gave up completely and wondered around the ship until I found myself on deck watching the arrival of the good ship Mv Mont St Michel in Portsmouth dock. It was strange but I recognised the ship when I saw her and remember that I’ve been on her on family holidays some 17 years ago, she’s aged well. Finally, the call came to re-join our vehicles and I followed the lines of people down stairs. When I got to the bike she was lying on her side next to a lovely vintage car. Luckily for me she hadn’t hit it, extra luckily I hadn’t parked one further back next to a new Range Rover. With my unwelcome early morning workout complete (it’s hard work lifting a fully loaded bike off a slippery ships deck.) I strapped my tank bag back in place and waited to join the traffic heading onto British shores. As the bike rolled off the ship I noticed that she wasn’t registering any fuel in the tank, I must have made it to the ship on fumes. Fortunately, there’s a petrol station 500m from the port and I pulled in, filled up and realised that I must be back in the UK for, not only was it raining, but I could have filled the bike several times over in most of Europe for the price of a single tank in the UK. The GPS told me the MoT station was 5 minutes away so I headed there and waited for it to open. The rain had eased off and I sat outside and listened to some music while I waited. An hour later and life was being breathed into the garage so I went inside and enjoyed a free coffee while the guys turned on the computers and opened for business. The man behind the counter was ignoring me now and trying to get on with his work. Time to shut up and stop playing the worried parent while my baby went for her tests. By 9am the bike was done and given a pass with 3 advisories; 1 for the broken lever, 1 for the worn chain, and one for the worn sprockets. I knew about all three and was very happy. Next up; road tax. The MoT wouldn’t be on the system until later so It was going to be a Post Office job. “No problem, there’s one just down the road.” Said a helpful man in the waiting room. So, heaping praise and thanks on the MoT team and the local chap I set off down the road. By 9:30am the bike was legal and I was off to see my Godmother near Warminster. I pulled out onto the wrong side of the road and set off mentally chastising myself and shouting “Stay left!” into my helmet. It was great to see my Godmother and her husband after so long and we enjoyed a brew and a catch-up before I set off to stay with my sister near Cirencester. 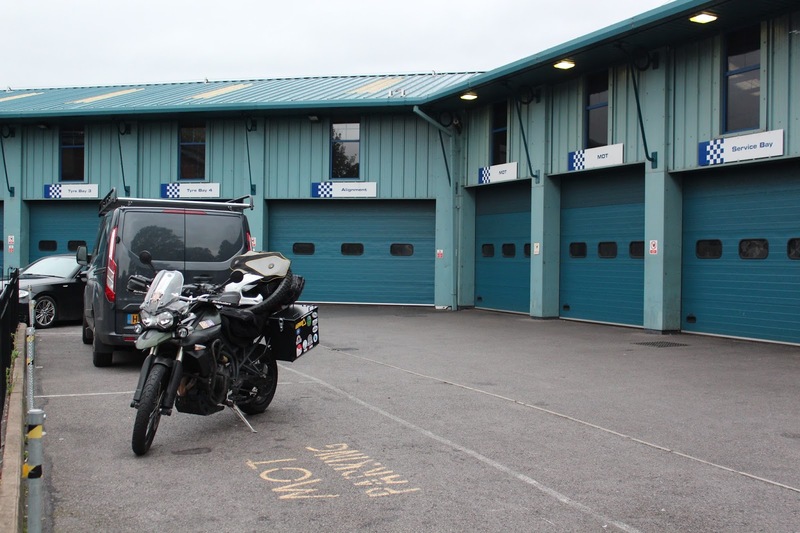 The fastest route from one to the other takes in a huge number of road side “caffs”. I could smell them before I saw them and I was longing to stop and indulge in a bacon butty (“cob” for those oop north) and a brew. I needed to stop and call my sister and a friend who I was hoping to catch up with anyway; the perfect excuse for layby bacon. I pulled in, made the calls and ordered a butty and a mug of tea. Too good for words. The butty was cheap white bread with too much butter, piled with bacon (including little crispy burnt bits) and ketchup. The tea was the cheapest out there and came in a large white mug with a splash of milk. The whole wonderful meal came to less than 4 quid and was the best thing I had eaten for ages. Feeling wonderfully unhealthy I headed onto my sister’s house. She wasn’t in and the house was locked so I chatted to an old friend of my brothers who was restoring a car in a shed nearby. He had a look at the bike and spotted the knackered chain and we set about tweaking and oiling to make it last a few more miles. With that done he also helped to straighten out a pannier that got bent in a one sided argument with a dirt track in Romania. As we were finishing Bruno, an old school friend, arrived and we sat around talking crap for a while. Still with no sign of my sister we arrived at the only logical conclusion to resolve the situation and went to the pub. Two pints later my sister arrived and we finished up before Bruno went home and we headed into town to buy supper. When we arrived back at her place it was nearly 6pm and I was finally able to grab a shower and change out of the clothes I had been wearing since leaving Pierre and Brigitte yesterday morning. The evening was a relaxed affair and I even got to see my niece and sister-in-law before I crashed into a fitful sleep. Guy grew up in Wales, went to school in England, started riding at 12 & shunned university. 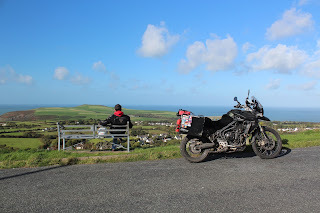 Welcome to yet another unprofessional, poorly written motorcycle blog. I've put this together because there doesn't seem to be a blog out there that covers the prep for a motorcycle trip and detail about the bike and kit used. I hope this bridges that gap.